Putting together a Christmas feast is not easy. Trying to get all your dishes ready in time whilst making sure your turkey doesn’t dry out but still gets roasted to juicy perfection is harder than trying to get everyone to agree on a day. Which is why we’re thankful for festive sets which make organising a party SO much easier. With all the big dishes out of the way, you can focus on the more important things, like how many bottles of wine to get and who’s in charge of the Spotify playlist. White Rose Cafe in York Hotel has brought back their EZ Festive Party Pack again this year, which is a delightful hamper of Christmas delicacies that can feed 5 to 6 people. Choose from either the mouth-watering Roasted Rosemary Chicken with Lemon, Garlic and Basil or the Roasted Kapitan Chicken inspired by the spices and flavours of Peranakan culture as the main highlight for your feast. 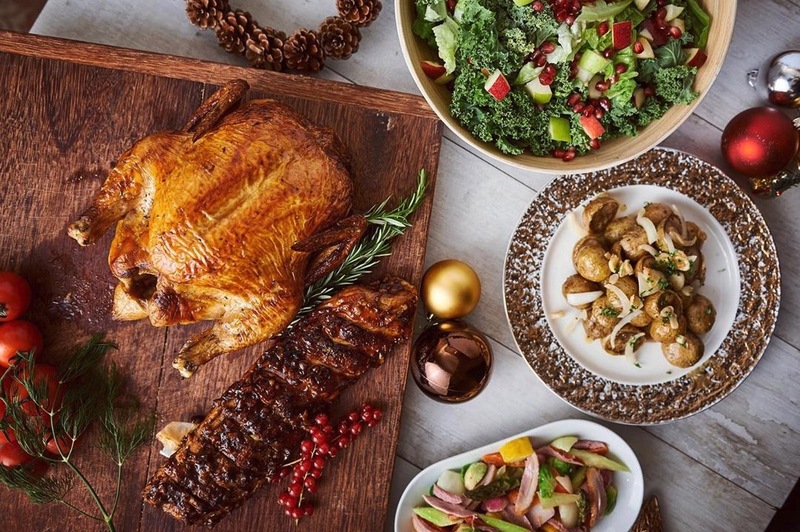 The party pack also includes all the trimmings with 4 sides – the Romaine And Kale Salad with Pomegranate and Apple, Baked Baby Potatoes with Oregano, Butter, and Garlic, Barbecue Pork Ribs and Sautéed Seasonal Vegetables with Smoked Duck. And if you’re worried about all the feasting, you can rest assured that the sides are as healthy as they are delicious. Some people might feel that the Christmas spirit wouldn’t be complete without an actual turkey sitting on their table. York Hotel also does a magnificent Whole Roasted Turkey with Chestnut Stuffing, Cranberry Sauce and Brown Sauce for just $132. Other seasonal roasts include classics like Honey Baked Ham ($130) and a Roasted Beef Sirloin ($80/kg). Like we all know, preparing a feast doesn’t happen overnight – all orders for York Hotel’s Christmas goodies requires an advanced order for 3 working days. You can place your order by calling them at +65 6737 0511. And if you’re a DBS/ POSB, UOB or a Maybank cardholder, you also get to enjoy 10% off your bill if you spend more than $200 nett in single receipt. York Hotel’s EZ Festive Party Pack, $150, is available from today until 1 Jan 2019 for pickup from White Rose Café. An advanced order of 3 working days is required – last day to order is 28 Dec 2018.